Where are you off to this summer with your mobile? Using your mobile phone at the wheel in Europe could cost you more than you think if you're travelling about a bit. 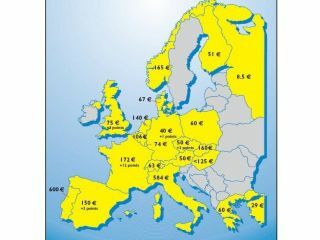 A study by Jabra has shown you could be stung for up to €600 if you get caught with your mobile plastered to you ear, with Portugal (€600 / £475) and Italy (€584 / £462) among the highest chargers. If you're feeling a bit risky, you can always try the offence in Greece, where it will cost you a mere €60 (£48) to get nicked, but they'll have your license for a month, which might destroy your fun if you're on a driving holiday. It seems the place to go if you're into getting fined for using a mobile while driving, but haven't got much money, then Russia is your destination of choice. For a mere €8.5 (£6.70) you can drive with your tunes playing and chatting to that delightful girl you met in Moscow the night before if the police catch up with you. Have a look at the handy map if you're planning a mobile-happy holiday across the continent.